Christmas just isn't Christmas without a Christmas tree – even an artificial Christmas tree – and nothing compares to the joy of decorating it (other than ripping open gifts, obvs). If a real tree isn't an option for you, you'll want a convincing, affordable, easily storable artificial Christmas tree that will look good for years to come. Here's our pick of the best. Find more Christmas decs and gifts on our dedicated page. The Blue Mountain Spruce from Cox & Cox will delight those who like a Scandi touch in their Christmas decor. Coming in unlit or pre-lit versions, this tree has frosted sage tips and a full shape. It is very cool in tone and will look lovely against a light and neutral backdrop. It costs £250 unlit, £350 pre-lit. The 7.5ft Deluxe Fraser Artificial Christmas Tree from Wyevale is very impressive: not only is it one of the tallest we have found, but also one of the densest, with realistic-looking pine needle tips. It is a satisfyingly rich emerald colour. At £400, it is one the priciest around, but it will look amazing in a high-ceilinged room. A very affordable option, the Kaemingk green and white snowy 'Imperial' 6ft Christmas tree from Debenhams has a satisfyingly traditional pyramid shape and has the added excitement of snowy frosting. At 6ft tall, £80. 4. A narrow tree for small spaces anyone? For a great selection of artificial trees at very affordable prices (that you can grab while you shop – probably online – for your festive groceries), head to Asda's George Home. Classic shapes, frosting, great value. We love the 7ft Deluxe Western Pine Green Christmas tree from Dunelm. It has a very natural finish with its clusters of slightly longer needles. It doesn't look too symmetrical, and has rich forest tones that will complement most rooms. It costs £70, or £99 with LED lights. Want a tree that looks like it's landed in your living room straight from Narnia? Search no further than the Isla Pre-lit Diamond fir tree from John Lewis. Very frosted and very bushy, this won't be the most natural-looking tree up close, but it will transform a large living room into a fairy tale setting. At 7ft, it costs £249. Another frosted option, the 7ft Snowy tree from Marks and Spencer benefits from longer branches that make it a stunning Christmas centrepiece. We like the frosting, too – it's been sprayed on in clumps, making it look more realistic than an all-over thin frosting would. And at £75, it's a steal. The 7ft Canadian Fir Christmas tree from Wilko is bushy! It is advertised as the company's 'fullest-looking artificial tree', and we can see why: the branches are hooked and made with lots of softer, wider-type artificial needles. Perfect for those who want the classic, fluffy tree look. 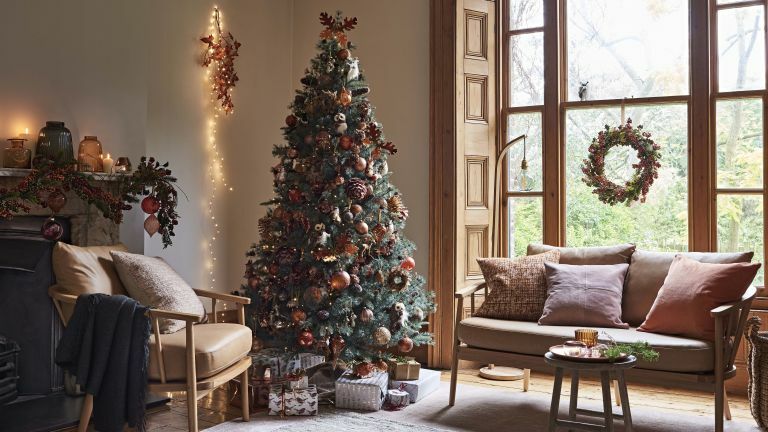 Probably the most natural-looking of all the artificial Christmas trees we've seen, the 7ft Highland pine from John Lewis features a slightly irregular outline and real pine cones. The overall effect is very convincing and will look particularly lovely as part of a traditional or country-style Christmas arrangement. Love the magical sight of a fir tree covered in snow, but don't have one growing in your front garden? The Grandis Fir collection from Lights4fun has been meticulously crafted to look as real as possible, with some sparseness to the top branches for an ultra-realistic look. Choose from unlit or pre-lit options. Less concerned about your tree looking natural and more about creating a stunning decorating scheme? The stunning 6ft pre-lit white tree from Wilko will work brilliantly as part of a Scandi Christmas theme, and will be especially effective as part of an already neutral or white decor.